Portrait of Susan Wilson, September 2105. 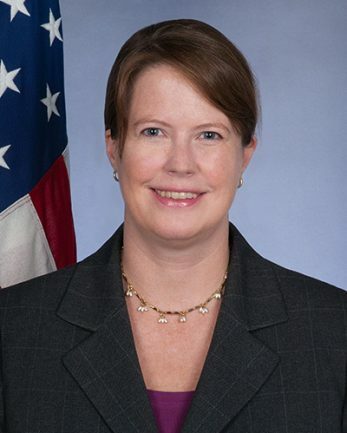 Susan Wilson was the Principal Officer for the U.S. Consulate General in Edinburgh, Scotland, United Kingdom from August 2015 to July 2018. A native of Richmond, Virginia, she most recently served as the Public Affairs Officer at the U.S. Consulate in Adana, Turkey, where her two main priorities were encouraging the internal peace process in Turkey’s volatile southeastern region, and working to alleviate spillover effects in Turkey from the ongoing humanitarian crisis in Syria. She also served as Assistant Public Affairs Officer in Ljubljana, Slovenia; and as Vice Consul in Kingston, Jamaica. Prior to joining the State Department, Susan was a Peace Corps Volunteer in Jizzak, Uzbekistan, and also taught as an adjunct History instructor at Germanna Community College in Fredericksburg, Virginia. She holds a B.A. in Medieval Studies from Georgetown University and an M.A. in medieval history from Virginia Commonwealth University. Susan is married to Michael Leath, and they have two children.